"Dre's good everywhere. No surprise," Mattingly said. "He had a nice swing on the ball with a guy on third. He looks good. He's actually swinging the bat better the last couple of days, you could see his timing is coming." There's no easy solution to the Ethier conundrum. Will he remain sitting amongst a crowded outfield in Dodger Blue or be sent elsewhere to have an opportunity to play everyday? A part of me wishes they could find a way to keep the longest tenured Dodger on the roster, but I realize that that's not the best situation for either Andre or us. Photo above via Jon SooHoo/LA Dodgers 2015. Go here to check out more pics from Jon from yesterday. This is funny stuff. Via Matthew Moreno at Dodgers Nation, "Brett Anderson Asks If Clayton Kershaw Will Buy Him An Apple Watch." Via Ken Gurnick at MLB.com, "Mattingly thinks Seager could handle bigs." "You want to make sure he fully develops. 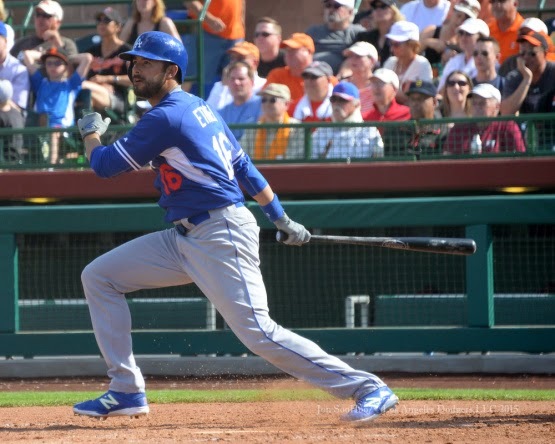 There's more for him to pick up," said Mattingly. "If the situation was different, I'm not sure you wouldn't just throw him in and let him play and get the experience here. But that's not the situation here." Via Ken Gurnick at MLB.com, "Puig hits first spring homer, stands out on defense." By all accounts Puig appears to have taken that next step. "Today, he was moving on every pitch," Mattingly said of Puig's focus. "All you ask is for the guy to be ready to go. The ball he cuts off in the gap is a great play. Maybe it doesn't make SportsCenter, maybe you don't notice, but it's a great play. And the throw at the plate, we thought the guy was out. He looks really good." Via Dylan Hernandez at the LA Times, "Chris Hatcher hopes to catch on as Dodgers' temporary closer." Dylan lets us know about his transition from a catcher to a pitcher. "I didn't take it as a slap in the face, like, 'Hey, you're not good enough,'" he recalled. "I took it as, 'Man, this could be a smart move.'" Via Bill Plunkett at the OC Register, "Dodgers pitcher Brandon McCarthy says he's ready to make his 30s his best decade by far."